• "During my time with Angela we spent an hour and a half once a week for five weeks looking into "where am I?" and "where do I want to be?" What was refreshing about those two questions was that the answer could be exactly what it happened to be. I didn't need to be looking for something specific, or define my answers by society's terms, or other's expectations of me. Angela allowed me, and honestly helped me, to let the answers come out as they were. The best way I can describe the time working with Angela one-on-one is as a gift. It was a gift to be asked those questions without an ounce of judgement, and then given the space to explore what came out. I painted of course, which was freeing and creative, but more than that we were really able to look into my specific situation because the whole thing was about, well, me! My "homework" was tailored to my creative and expressive needs, and Angela was able to adjust our class time as well as my own personal time based on what came out of our conversations and creative exercises. I will always remember that at one point Angela said to me, "I think I figured it out. It's writing." and it was like I had been given the mirror I needed to see what was always in me. I think I knew that on my own, but I was resisting it, and Angela was able to find it and present it to me in way that made me feel safe and inspired. I will continue to practice the exercises Angela taught me to remain present and to remember to give life to my creative self for the health of my whole self. I also know that I have a life boat along the way if I ever feel like I am drowning, because I will be getting on and off the wagon a lot as I move towards my passion. It's not that I am fixed, or that I found THE answer, but that I was able to produce some motion which makes all the difference. • "In the beginning, I stared at her white oracle of the blank paper and asked her to show me my new dream. I was on the precipice of changing directions in my life. What I felt would last maybe a few hours turned into five months. Every time I returned to her, she spoke of more: "this color here," "that shape there," "yes do this," "don't forget to do that," "yes, that would feel alive," "what about this?" At some moments she was gentle and sweet and at others she was quite demanding and challenging, but still I continued. Some days I couldn't wait for the conversation to begin and some days all I wanted was for her to be done with me. 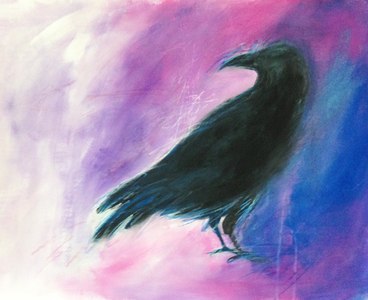 Last Friday morning I went into my intuitive painting class at Painted Crow expecting to again continue, but the moment I hung her up, she loudly said "STOP! I am finished!" I couldn't believe it. My heart burst! After putting so much blood, guts and tears into her every layer and every single last little detail, returning over and over, without question, to the listening of what wanted to come out, finally I was done! And at the risk of sounding boastful, I must say, to me, she is magnificent!!! • “I spent the best day of Spring with Angela in her workshop, letting go of my inner control freak. 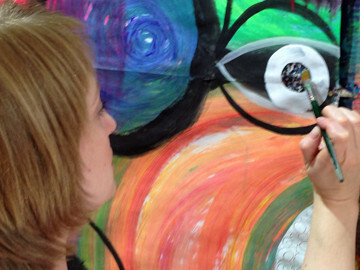 Angela’s class takes you on a journey through art where you learn by doing. 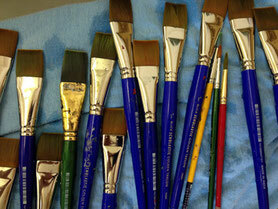 With no formal art training or painting experience –I honestly think the last time I painted was in kindergarten! — I walked into the session a wee bit nervous. I wanted to throw myself into this unknown environment and see what it was like to spend a day painting, but I also worried that I would be so hopeless it would be a disaster. What I found was a welcoming and low-key environment. What I learned was that painting is not just an act dependent on skill and practice, but an opportunity to walk/sail/dance/hike through your internal landscape. I learned that painting can be a visual diary. 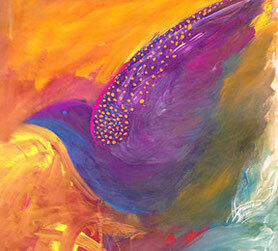 I learned that painting can be relaxing, cathartic, joyous, and, at the end of the day, pretty tiring. It’s surprisingly hard work!